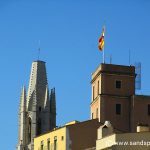 December 31st – While everybody else was putting on their glad rags and preparing for a Yuletide bash in the city, we were heading in the opposite direction – up into the hills in fact. 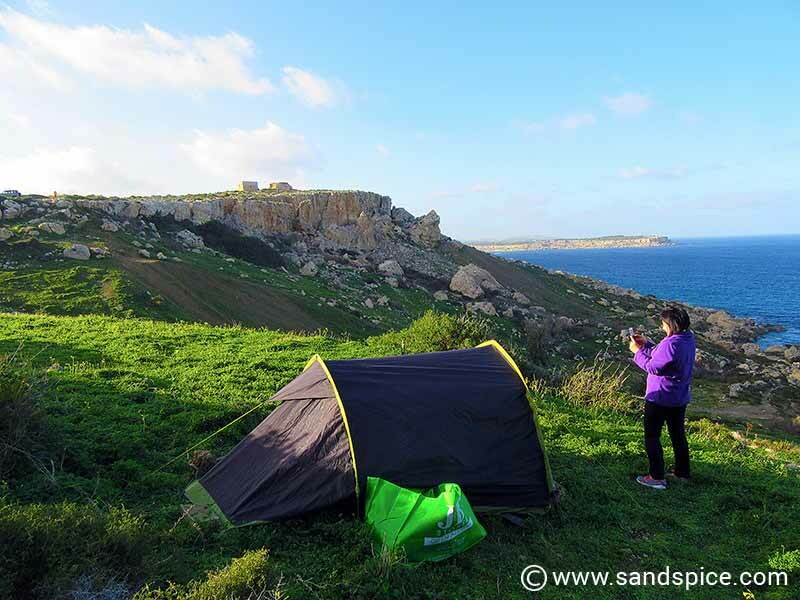 We were planning a New Year’s Eve Malta clifftop camping excursion. Something different, we thought – Just for the one night. Definitely one to remember… but hopefully for the right reasons. 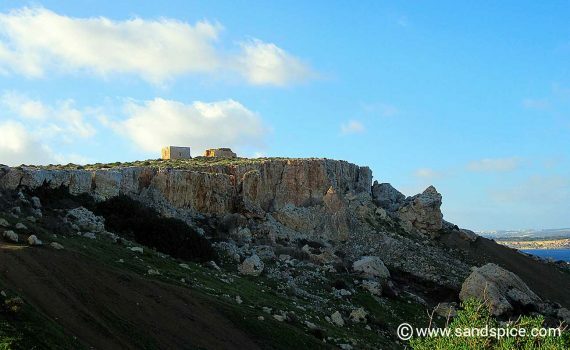 Our chosen location was the high rocky area behind Selmun Palace, near Mellieha on the north-west coast of the island. 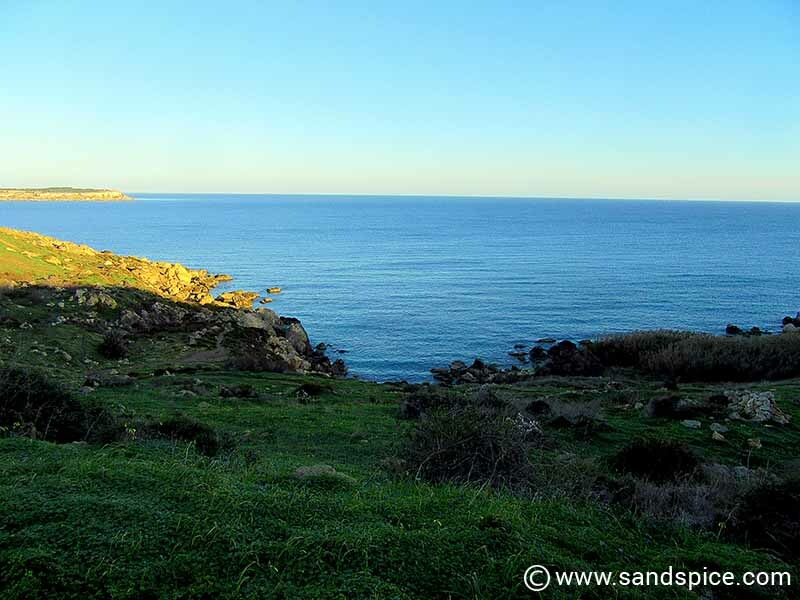 From here there are terrific views down the cliffs towards the open sea. The weather forecast was favourable for New Years Eve. The lowest temperatures during the night shouldn’t drop below 10°C. However, high up on the cliff, the wind chill straight off the Mediterranean would make it a fair bit colder. The biggest threat was rain. 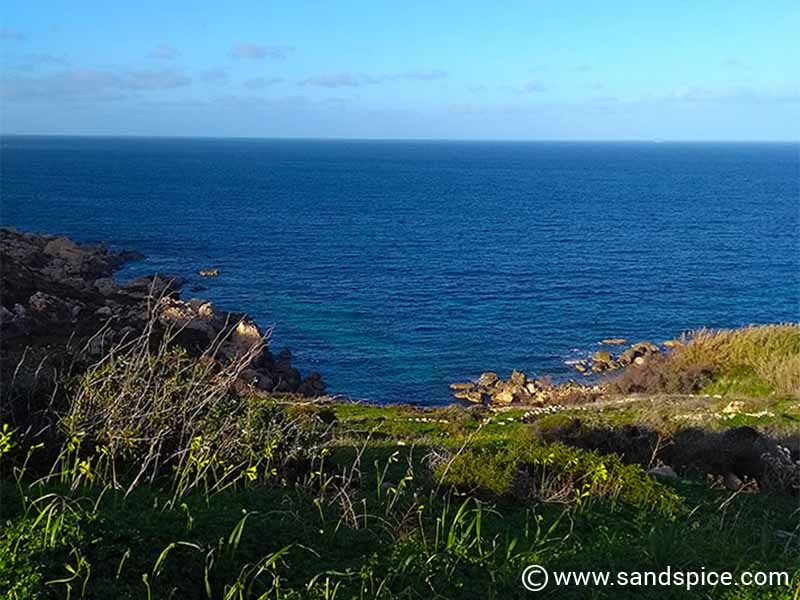 There had been some torrential downpours the previous week, and though the likelihood of rain on Dec 31st was just 10%, the weather changes quickly in Malta. The previous day we had visited the area to scout out a decent campsite. This is a popular place with the locals in summer, but in the winter we didn’t think there would be much competition finding a place to stake out. 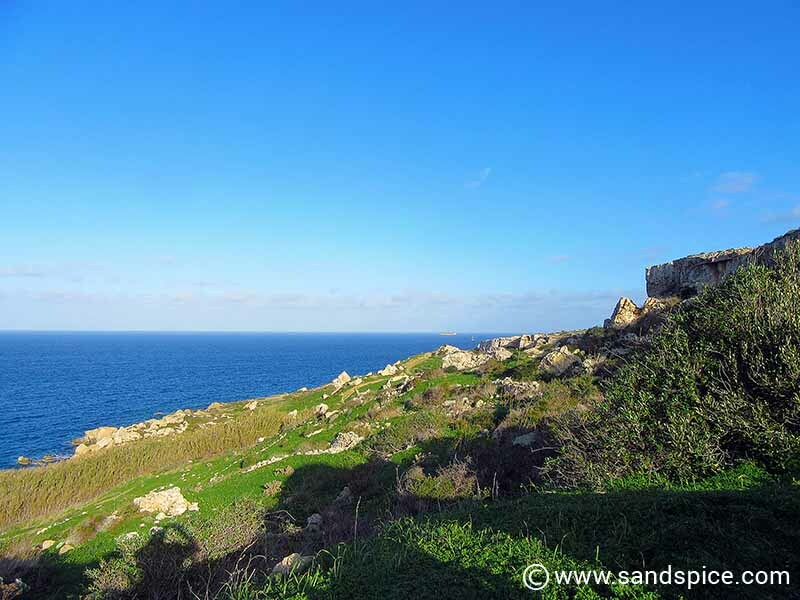 Sure enough, after a 15-minute circuitous drive through the rough and narrow country lanes behind Selmun Palace, we reached a small promontory where we could park the car. From here on it was shanks-pony across steep and hazardous ridges to access what appeared to be promising locations for setting up camp. 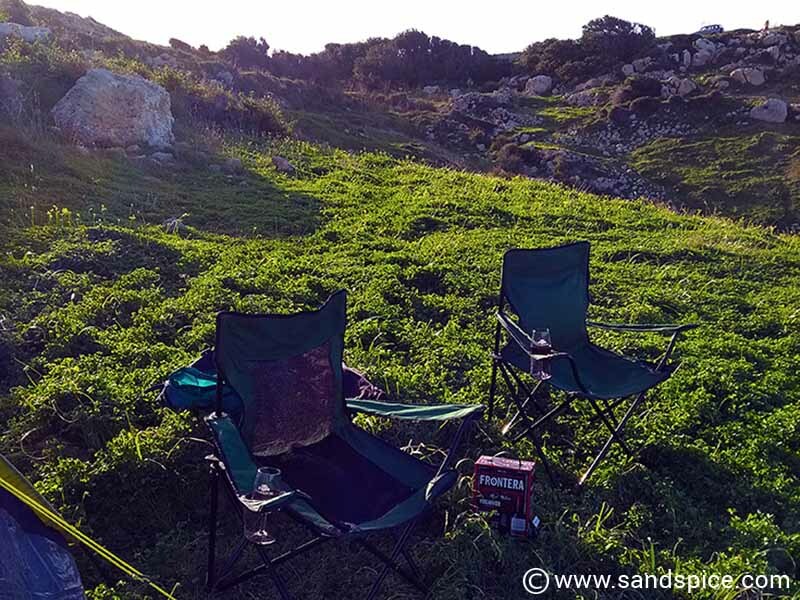 There was already a flattened and used campsite close to where we parked the car, but we were looking for something more pristine, away from wanderers, and with a better view. The spot we chose involved a steep climb up, and was hard enough to access empty-handed. We’d need to make multiple journeys to get up their with all our kit. However this spot featured a large flat grassy area to pitch a tent and plenty of rocks to build a fire-pit. 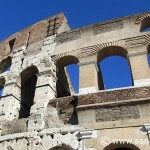 The following day – New Year’s Eve – We decided to set out shortly after lunch. It starts to get dark soon after 4pm, and we wanted to get set up before then. The sheer mass of equipment we were taking with us for just the one night was daunting. Tent, quilts, pillows, stacks of firewood, charcoal, barbecue, table & chairs, sleeping mats, 7 liters of booze, water, kettle, frying pan (for English breakfast), lamps, food utensils, sound speaker, and real glasses (cos I’m not drinking my bubbly from plastic). It was beginning to look like Shackleton’s expedition to Antarctica. 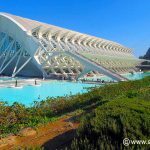 Given the Herculean task ahead of us I had a bit of a wobble – I’ve astutely avoided sleeping under canvas since waking up soaking wet in a tent when I was a teenager. And now – despite the benign weather forecast – dark clouds were starting to roll over. By the time we’d loaded the car and driven to our eyrie on the clifftop it was 1 pm. 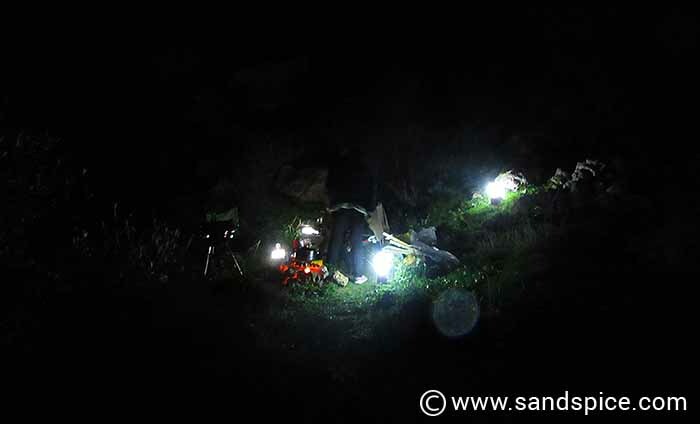 It took another back-breaking 2 hours and 7 journeys to get all our paraphenalia across the cliff to our campsite. On my last trip I noticed a car parked next to ours. Inside were a couple of shady characters inhaling substances. Well, if you’re going to do drugs this is about as secluded a spot as you’re going to find. I was just hoping that, this being New Year’s Eve, the regular junkies would be finding more interesting places to visit. At least the sky had cleared up and the sea breeze wasn’t too brisk. 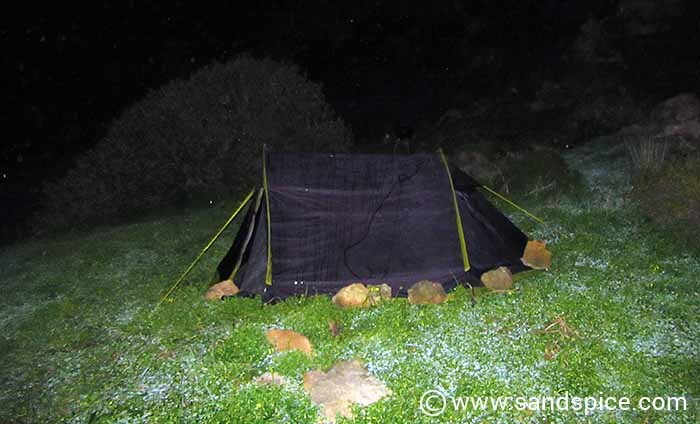 Nevertheless, after putting up the tent we placed large rocks around the tent skirting so we wouldn’t get blown away during the night. Next job was the fire pit. After digging a hole in the clay (did I mention we’d also brought a shovel?) we piled rocks around it and threw in some wood and charcoal. Now it was definitely time for a drink. I reckoned that with a 4-litre box of wine, bottle of Laphroaig whisky and 2 bottles of bubbly we should be alright for booze. As we sat back and relaxed in the afternoon sun, glass of wine in hand, things were beginning to look up. While we rested we noticed a few other visitors in the distance, wandering around the promontory, taking pictures of us (!). Soon after though the light gradually started to fade and a cool breeze kicked up. Time to light the fire. We’d brought a mountain of scrap wood with us, together with self-lighting charcoal and fire-starters. However, the most useful stuff for getting the fire going was the long stems of dried kindling we found growing around the area. 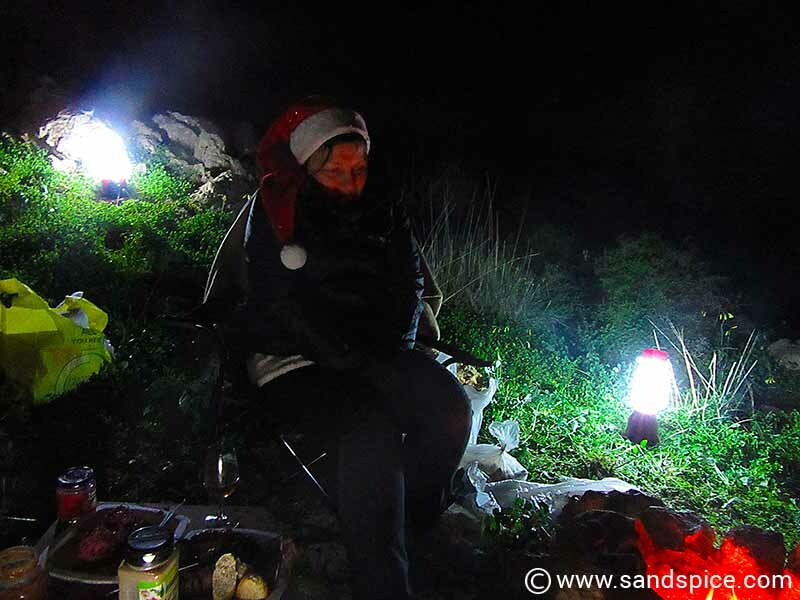 We also lit up the barbecue and soon had a focal point of warmth in the camp. Despite that, we were layered up with thermals, fleeces and hats: It was beginning to get decidedly chilly. Time to start on the Laphroaig! After several more drinks, something odd started to happen. The fire which had been burning briskly reduced down to red embers, and no amount of extra wood would bring it back to life. It was the onset of humidity… just like someone had doused the fire with a shower of water. Already, the outside of our tent was dripping heavily. Our pile of wood was likewise damp. With the help of a lot of fire-starters we managed to raise some flames, but now we had to use a lot of wood to keep the flames going. At least we could cook some food, but at this rate our wood wouldn’t last till midnight. Worse than this though… our wine was running low! God, it’s still only 8:30 pm! So we cooked and ate our pork brochettes, together with some spicy Russian salad balls, corn-on-the-cob and a baguette. We also had some jacket potatoes baking in the embers – they came out real tasty after we’d managed to lance them with a stick. 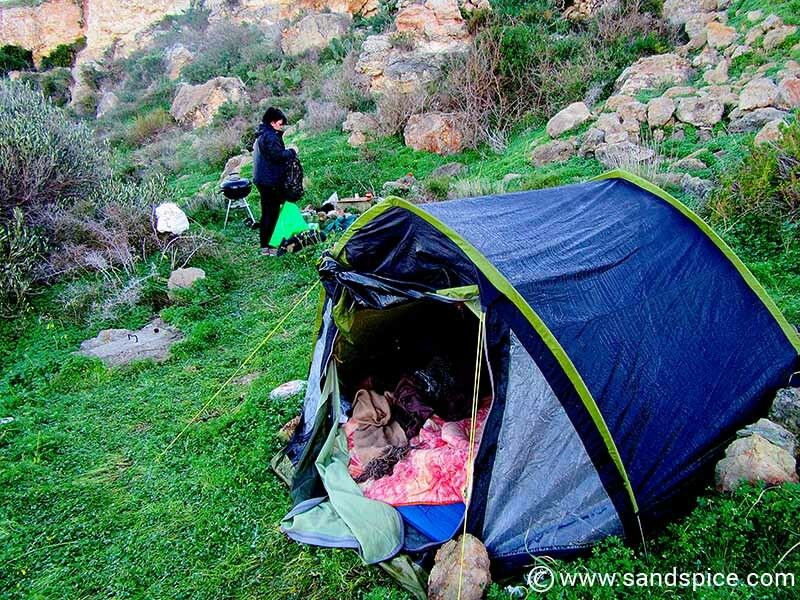 Outside the small sanctuary of our cozily-lit campsite it was now pitch black and silent. Apart, that is from the crackling of the fire and the sounds of Spotify from our bluetooth UE BOOM 2 music speaker. We’d already given up on the barbecue that we’d man-handled up the slope. It just wouldn’t re-light, even with the self-lighting charcoal. 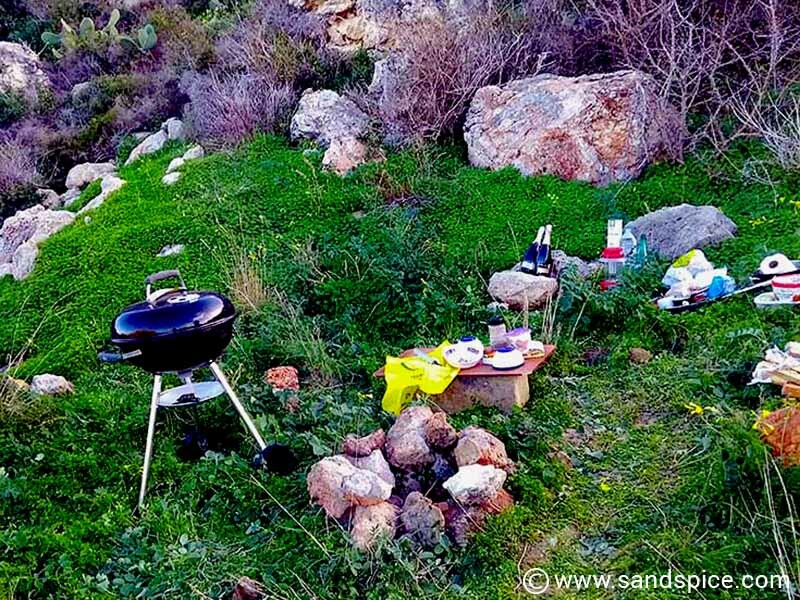 Instead we put the metal grill over the stone fire-pit and cooked everything there. We put our last lump of wood on the fire an hour before midnight. 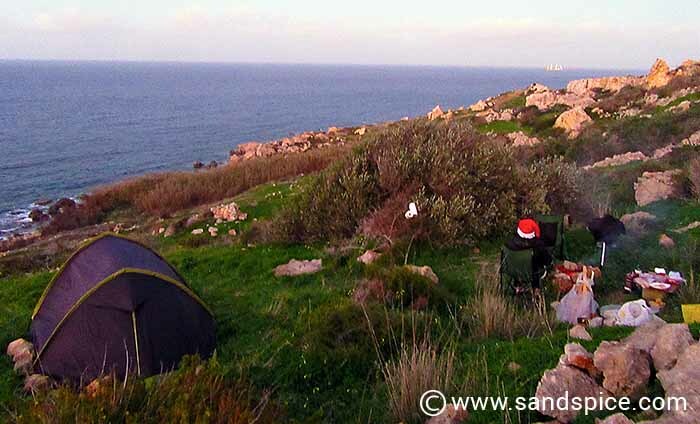 We would be celebrating New Year inside the tent – it was just too damp and chilly to stay out on the cliff without the comfort of the fire. So we retired into the tent with our last bottle of bubbly (the whisky and wine were long gone). At least we were warm and dry enough inside – not surprising with the mass of bedding we’d brought with us. Outside, even though there’d been no rain, everything was soaked through. Midnight finally came, and we toasted with our last glass of wine before settling down for a deep sleep… but it was not to be. Around 4 in the morning I woke up with the screaming abdabs. It could have been either the beetroot I’d eaten earlier, or possibly the booze? Either way, with this particular strain of Montezuma’s revenge there was no time to lose. I was out of the tent in a shot, tried to avoid the cliff edge, and assumed a particularly uncomfortable stress position while I did my business. We woke around 8 am to the sound of Motocross. Peeking out of the tent we saw a couple of bikers performing suicidal manoeuvres around the ridge below us. So much for a lie-in then. Our plan had been to make English Breakfast in the morning, but with no wood and a damp fire-pit that was going to be tricky. Instead, we wimped out. We decided to pack up and call it a day. It took an hour or so to get everything packed up and returned to the car (which happily was still where we’d parked it, in one piece). Despite the overnight humidity, we’d been really lucky with the weather. No rain and very little wind meant that we got through the winter’s night in relative comfort. Of course, the booze also helped. We can also report there were no landings of illegal immigrants, refugees or drug traffickers during the night. Our first priority on return to civilization would be that Full English Breakfast. 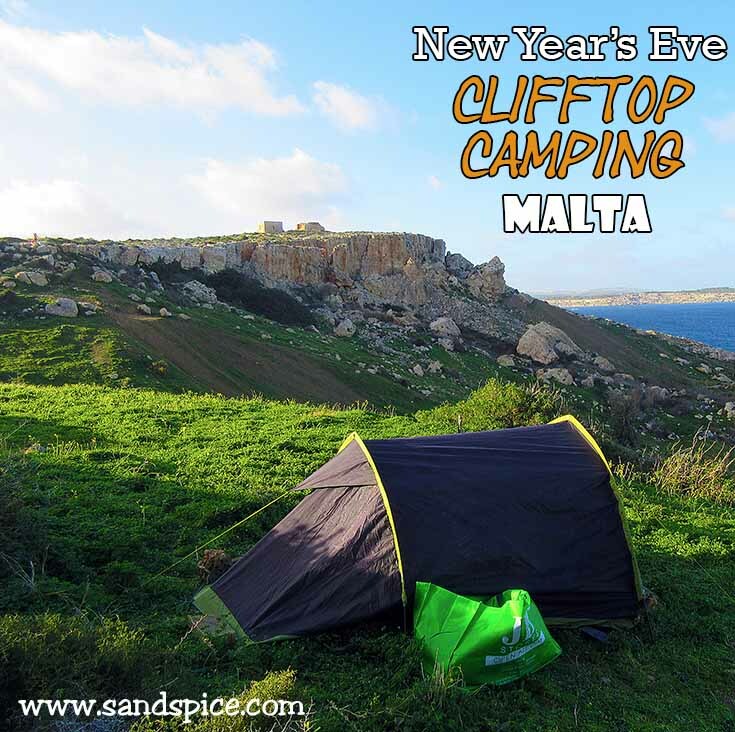 So our Malta clifftop camping excursion was a success, and we saved a fortune avoiding the cost of a New Year’s Eve open bar at one of the venues in town. … But next year? I think we’ll be spending New Year’s Eve indoors.